According to the calendar, at least, winter has come and gone, and that means a dreaded new season has arrived in Chicago: pothole season. A winter of wild weather swings – remember that 70-degree swing that closed out the polar vortex last month? – made 2019 an especially tough year on our streets. The city notched over 2,000 more pothole complaints this February than last. In response, the Chicago Department of Transportation beefed up the number of pothole-patching patrols. Throughout March, as many as 40 crews have been working days, nights and weekends shoveling, raking and tamping asphalt mix into the potholes pockmarking the city’s streets. If you and your car have gotten rattled by potholes, the city asks that you let them know where to send a crew by using the web portal at 311.chicago.gov, the CHI 311 mobile app, or just by calling 311. CDOT says crews will be out on the streets as long as the weather cooperates, so they ask you to keep an eye out, slow down and drive carefully while workers patch up the roads to keep everyone safe. 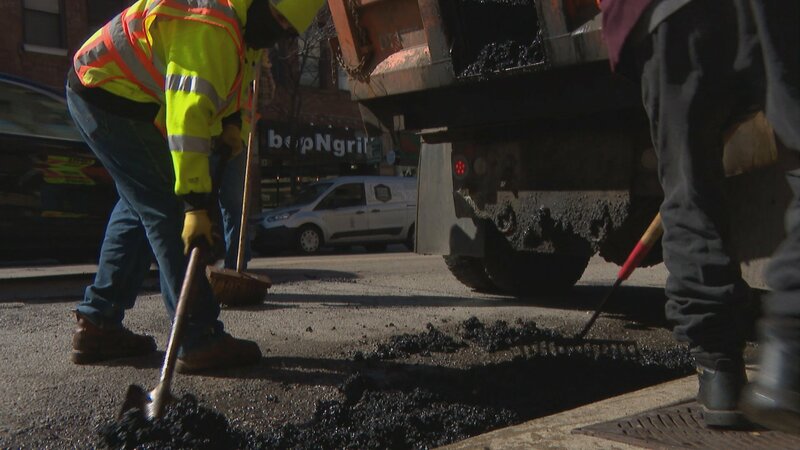 Their goal is getting the streets running as smoothly as they can in time for the next season Chicagoans dread: the paving season, which begins in April.